Votive candles sold individually. These can become completely molten when lit, and should only be burned inside a votive cup. The perfect compliment to our pegged votive holders, these little votive candles are made of 100% beeswax, with cotton wicks. They carry a rich honey scent. Our pure beeswax votives, like other traditional votives, are made to become molten and fill the glass or holder they are contained in. Please be sure to burn inside a holder which is just wide enough to fit the votive but not too wide. 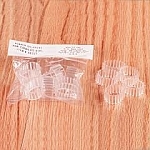 These measure 2 inches high, by approximately 1 1/2 inches in diameter. High quality candles just as described delivered in a timely fashion in perfect condition. Thank you! 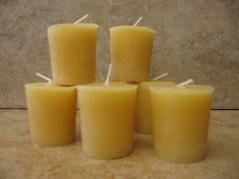 I love the fragrance of these beeswax votives. They do melt, so they must be used in a glass. They burn for a much longer time than paraffin candles. Well worth the price. Our 100% beeswax candle collection features 8 and 12 inch tapers, votive candles, and pillars in 2x3, 3x4 and 3x6 inch sizes. Available in raw and filtered ivory colors, or in forest green, moss green, or deep red (votives are currently sold in the raw color only), these beautiful candles all carry the rich scent of honey.